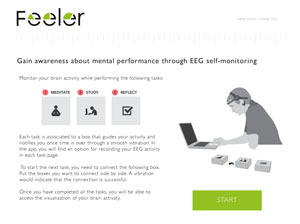 Feeler prototype seeks to foster reflection about learning experiences through EEG data. 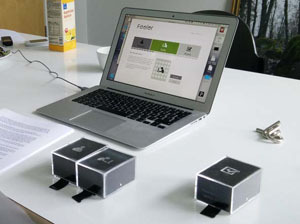 The tool uses a brain waves self-monitoring device and visualizes the data through a desktop app. 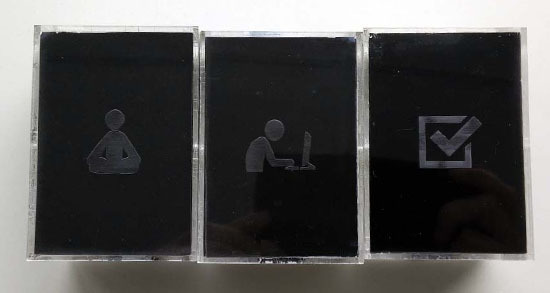 When monitoring brain waves activity, a set of computing objects guide users’ actions. Feeler concept design follows the assumption that multitasking challenges students’ ability to concentrate in their academic activity. Therefore, Feeler design is oriented to encourage performing one task at a time. We do this by inviting users to follow a script that divides an academic task in three moments: 1) meditation, 2) study and 3) assessment. 1) In the meditation part, users are invited to relax through calm breathing during 5 minutes. The led lights placed inside the physical module focused on meditation guides users’ breathing rhythm. 2) During the study time, users perform an academic activity of their choice. The module gives feedback about the pass of time through a grid of LED light progressively. a) How did you feel during the session? b) What do you expect from EEG data? c) What would you change for the next session? Feeler objects use Arduino and Bluetooth connection. The prototype has been developed in collaboration with Niklas Pöllönen who was responsible of the technical aspects. 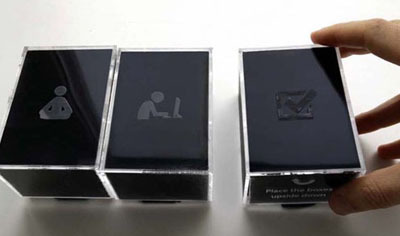 When interacting with the physical modules, users get visual and haptic feedback. In order to start next task, the next module needs to be placed next to the previous one and therefore connected (a vibration indicates successful connection). When the time for a specific task runs out, the module vibrates. Once users have completed the self-assessment module, a visualization of their brain activity is displayed in the digital app. This information only shows at the end of the session and it’s intended to encourage users make connections with their previous experiences. 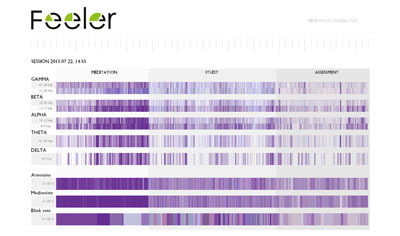 The datavis includes information about the different brainwaves (Delta, Theta, Alpha, Beta and Gamma) as well values regarding attention, meditation and blink rate. It is expected that the visualization of this data would foster students’ curiosity to understand more how the different mental states affect their study activity. 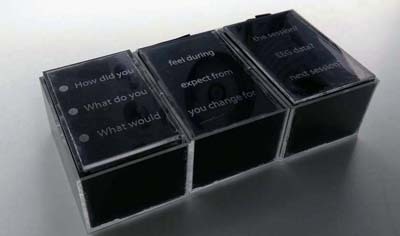 Feeler is a tool intended for developing awareness and reflection, so in case students find out something that does not match their expectations, Feeler can become a tool for personal inquiry. Rather than becoming a daily use tool, Feeler is intended to be used for a limited amount of time, which each person needs for increasing their understanding about herself. In addition to foster reflection and self-understanding, Feeler offers great opportunities for building hypothesis, testing, analysing the data and make meaning out of it. All these skills are valuable in learning and are transferable to many other situations in students’ life. The ultimate goal of Feeler is to encourage students take control on their learning and identify what works better for them considering how they feel.